watercolor on canvas, 8 x 10"
This summer I accomplished a lot: my husband and I went on a 4000 mile road trip to see loved ones and attend a math conference; I completed some major home improvements, including re-doing my studio; I helped my husband organize and run a math conference; we also hosted numerous guests; etc.. The thing that I let fall by the wayside, however, was my art. I was so busy "doing" that I let creating and blogging slide. My husband has just started back to school, and that has given me the final push I need to get back into art and blogging. I started with this two- painting series of banana peppers called, The More Things Change ... 1 and The More Things Change ... 2. They are painted from life in my newly re-done studio. ... 1 is a watercolor on canvas, and ... 2 is acrylic on canvas. 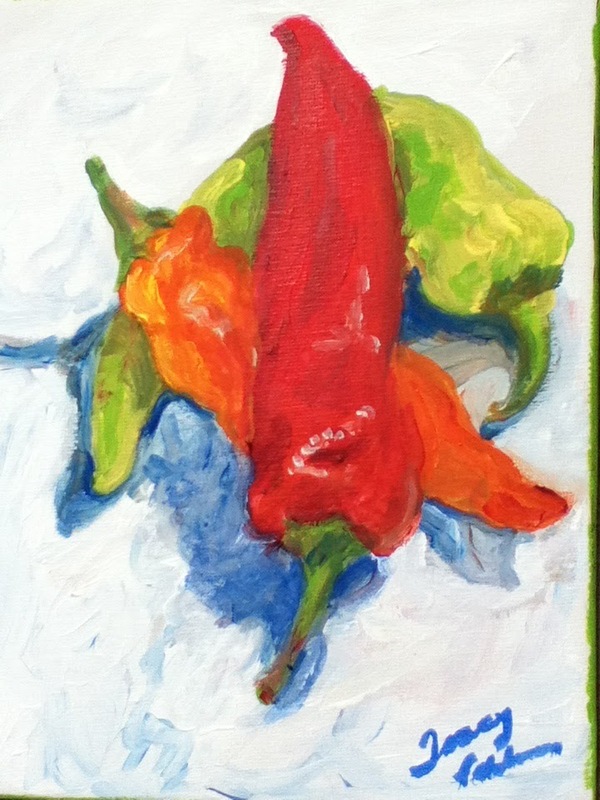 ... 1 is a landscape view of the peppers and ... 2 a portrait view. I decide to do a 2-painting series to recapture the joy I get from adding texture to paintings. In the spring, I had been painting exclusively in watercolor. I love the luminosity possible with those paintings, but the nature of watercolor paints means that textures in watercolors are only created using illusion. However, I was reminded of how much fun I sometimes have adding a real textural element to my paintings when I was choosing which works to display on my walls before our many visitors arrived. Thus, I've decided not to limit myself to watercolors for a while. That is why The More Things Change ... became a two-painting series -- one in watercolor and one in acrylic. acrylic on canvas, 8 x 10"
The title of these paintings was inspired by a conversation I had with the little Amish boy who sold me the subject of these paintings. I asked what was the heat difference between the peppers. He patiently explained that all the banana peppers I had chosen came from same plant. However, he went on to explain, as each pepper matures, its color changes and the pepper gets hotter. That idea that things so apparently different could really be the same underneath fired my "reality with a twist" passions, and gave me a title for these paintings: The More Things Change .. which I assume the viewer will know is an an expression that ends with, "the more things remain the same" and which is true of these peppers that seem on the surface to have morphed into entirely different things, but in reality remain the same vegetable. If you are interested in buying the pieces, they available on Daily Paintworks.comhttp://www.dailypaintworks.com/Buy/Auction/73270. For a couple of weeks, I'll be auctioning them -- minimum bid starts at $15 plus shipping. The price will go up when the auction ends. Wondering about the green you see in the side of ... 2's photo? It is paint from the side of the canvas. I painted the sides the green of the bottom pepper, and really liked the way it looked peeping over the side, so I decided to leave it. Glad to see you're back. I'm really enjoying the new work. I clicked on the link to the DailyPaintworks.com but it took me someplace else. Love your peppers Tracy and I'm so glad your back!